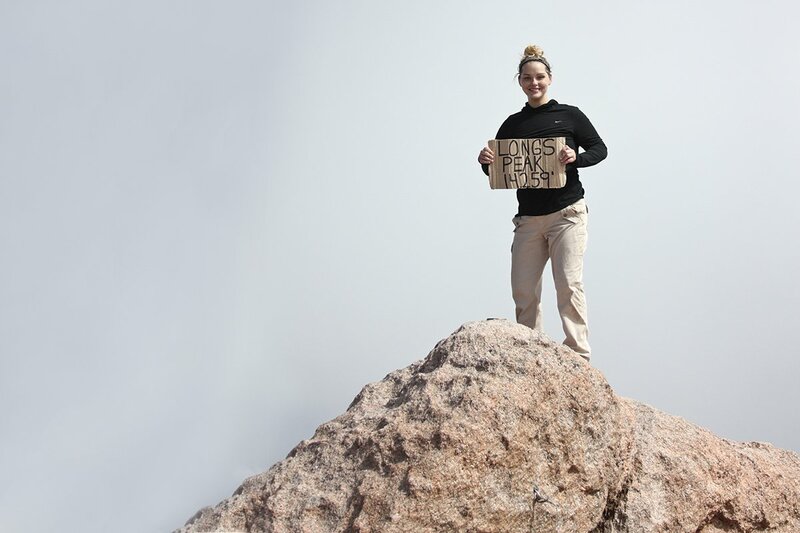 Looking for a new challenge, Senior Editor Savannah Waszczuk traveled to Colorado and climbed Longs Peak, the highest mountain in Rocky Mountain National Park. Read about her experience, and learn how to plan your own mountain adventure. It’s not unusual to hear of someone discovering their love of hiking after their life takes a turn for the worse. While it’s far from romantic, that’s my story. I first started tackling trails after I handed over an engagement ring and walked away from a six-year relationship a couple of summers ago. At the time, most days of my life were pure torture, but every weekend was filled with a new adventure. 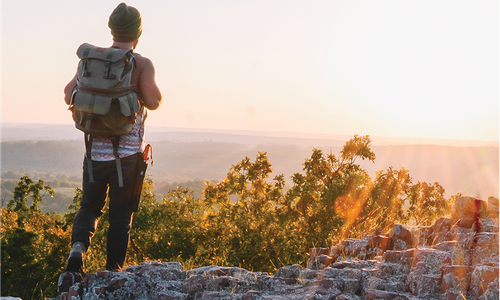 I fueled my new-found passion with a cheap daypack and a pair of hiking boots, and I spent every free second I had logging miles around Springfield, Branson and northwest Arkansas. Plain and simple, hiking made me happy when nothing else could. It didn’t take me long to fall in love with the sound of my own footsteps. As time passed, I became hungry for more. I wanted longer trails. I wanted higher summits. I wanted to climb a massive, unforgiving, unpredictable mountain. Then June rolled around, and I was invited to go hiking in Colorado with Dylan Gideon, the very boy who broke my heart in the first place. Life is ironic sometimes, isn’t it? I agreed, and we started counting down the days to our trek to the Rockies with two of our friends, brothers Drew and Sean Allmeyer. The guys had been planning the trip for months. Their agenda was challenging, but concise: they were visiting Colorado for 10 days and planned on climbing seven fourteeners, which are the state’s 58 mountain peaks that exceed 14,000 feet above sea level. Since I joined the trip at the last minute and was only able to take a few days off of work, I had to go with the flow. We looked at our calendars, and I got the news: I would be joining the guys for their hike up Longs Peak. Longs Peak was by far the most difficult mountain on their hiking agenda. At 14,259 feet, the mountain proudly towers over all surrounding summits as the highest point in Rocky Mountain National Park. It’s known for its many moods, with drastic, unpredictable weather changes that often happen at the drop of a hat. As I researched, I learned that my trip up Longs wouldn’t be a hike. It would be a climb. I’d face many challenges, like scaling up more than 600 vertical feet and hiking on narrow stretches of land hugged by sheer cliffs and 1,000-plus-foot drops. I’d also face risks. Even in the best conditions, Longs is one of the most difficult Class 3 fourteener scrambles in Colorado, and more than 60 people have died while attempting their journey up and down the beast. Sure, I was scared, but from the deepest part of my soul, I was also ready. More than anything else, I wanted to stand at the top of Longs Peak and see the world in a way I’d never seen it before. I spent five intense weeks preparing in the gym, and then we were on our way. On July 27, I would tackle my first fourteener. While you don’t want to weigh yourself down, you also don’t want to be caught on the mountain missing a necessity. 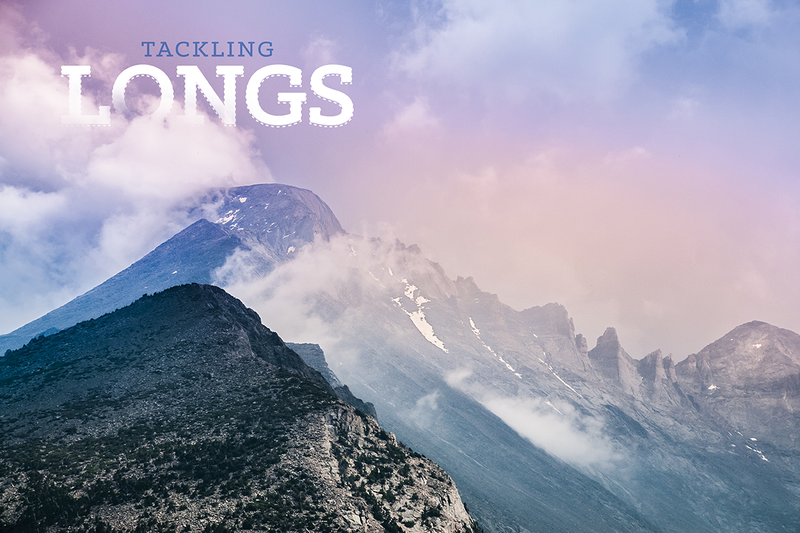 This list includes must-pack items to include if you’re camping on Longs Peak. Photo by Dylan GideonLocated just south of Estes Park, Colorado, Lily Lake is a great roadside attraction equipped with picnic tables, a walking trail and a great view of Longs Peak. After a lengthy drive through Kansas, my heart skipped a beat when we reached the Colorado state line. Before too long, we spotted mountaintops in the distance, and we were soon rolling down Colorado State Highway 7, part of the Peak-to-Peak Scenic Byway that furnishes access to Estes Park and Rocky Mountain National Park. As we climbed through the Rockies on that gorgeous stretch of road, we rolled down the windows and took in the cool mountain air. I’d previously been snowboarding in Colorado, but this was my first visit to the state during the summertime and peak hiking season. It was different than anything I’ve ever experienced, and it was better than I ever dreamed. The air was crisper there. The sky was the prettiest shade of blue, and wispy clouds flirted with the mountaintops in every direction. Towering trees and dusty roads surrounded trailheads and scenic stops every few miles. Everything around me was breathtaking. As a novice hiker, this place was sublime. After grabbing a few groceries and doing the typical tourist things in Estes Park, we headed to the Longs Peak Ranger Station to pick up our camping permit for our hike. While some people attempt to tackle the entire mountain in one long and trying day, we applied for a permit to camp on the mountain and split our hike between two days. My stomach flip flopped with equal parts excitement and fear as we reviewed our plans with the park ranger. We were attempting to hike to the summit via the 15-mile round-trip Keyhole Route, which is only open for hiking without special wintertime gear and equipment a few months of the year. The ranger confirmed we were starting our hike around 4 p.m. the next day, then camping in the mountain’s Boulder Field for one night. The next morning we would tackle the most difficult part of the hike, the 1.5-mile climb from the Boulder Field to the summit, and then we would hike back down. Feeling eager and perhaps a bit too overzealous, I purchased a Longs Peak magnet and a long-sleeve tee to commemorate my soon-to-be accomplishment. I was there, and nothing could stop me now, right? And then the ranger gave us the bad news. “Now you all heard about the fatality yesterday, right?” he asked. My stomach sank to the floor. The ranger told us of a man who fell off the mountain and died the day before. We were all brought back to reality. I burst into tears the second I stepped back outside. Next we hopped back into our truck and shared a quiet drive to Roosevelt National Forest, where we found a fairly secluded numbered road that was open to free back country camping. As we built a fire, set up our tents and cooked a hefty meal over open flames, I talked myself into and out of the hike several times. But I knew deep down that I didn’t want to throw in the towel. Not yet. 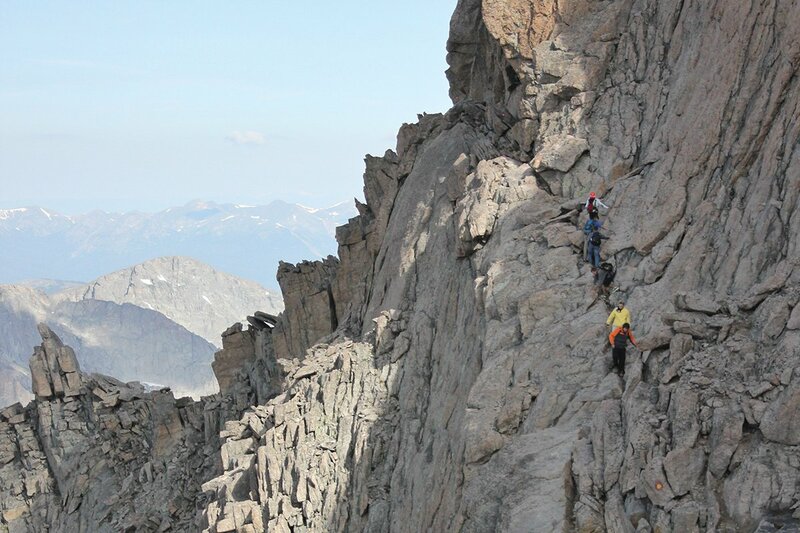 Photo by Dylan GideonOne of the biggest challenges on Longs Peak is climbing the Homestretch, a polished granite slab that requires nearly vertical scrambling. We woke up just after sunrise on the day of the big hike. It took a bit of time to prepare our massive campfire-cooked breakfast, which included bacon, eggs, potatoes and cheese jam-packed into freshly heated tortillas. You aren’t allowed to build a fire on the mountain, so we made the most of the last hot meal we’d have in a while. After filtering water from a nearby stream, we filled up our water bottles, loaded our packs and headed to the mountain. Located at 9,400 feet, The Longs Peak trailhead presents hikers with the challenge of high altitude before they even take their first steps on the trail. This was my first time hiking in high altitude, and I found myself struggling much quicker than I thought I would. I was out of breath and sweating a quarter-mile in. Carrying a 30-plus-pound pack on my back didn’t help. But we slowly began putting miles of wooded trail behind us. The first part of the hike was a bit monotonous, with switchback after switchback weaving us up a dusty trail surrounded on both sides by an endless sea of evergreens. We took a quick break at a waterfall then continued on, and we soon found ourselves above the tree line. The hike averages a 13-percent incline with some areas reaching almost a 45-percent incline, so it’s never exactly a leisurely stroll. But we finally reached the Boulder Field around 7 p.m. The field is just as it sounds—an enormous open area that’s filled with thousands of boulders, some that are as large as cars. We set up our tent in a designated camping spot, ate a cold dinner of prepared rice and jerky and went to bed. Before I knew it, I woke up to the sound of heavy feet shuffling outside of our tent. It was around 5 a.m., and hikers who were attempting a one-day trip to the summit were already well on their way. We layered up, downed some Clif bars and began what would be the hardest part of our 15-mile trek. The trip through the Boulder Field included a lot of jumping and scrambling. You’re literally just leaping from rock to rock on a journey up to the Keyhole, which is a notch in the mountain that’s become known as one of its most distinguishing features. Once you pass through the Keyhole, the climbing route to the summit begins. That moment went down as my first real wow moment of the hike. It’s where we first got a real glimpse of mountain views. And if you’ve never climbed a mountain, you don’t know what I’m talking about when I say “real” mountain views. We sat and took a minute to enjoy the snow-capped peaks staring back at us. I felt like I was on the set of a movie. I swear the clouds were close enough to reach up and touch. Next we hiked the Ledges, which is a section made up of very narrow ridges that jut out of the side of the mountain with nothing between you and a terrifying drop. This section is one of the most dangerous of the hike (and where the man fell and died the day before). With no actual trail to follow, it was all about navigating from this point on. Rather than following a path, we followed a series of red and yellow bull’s-eyes that marked the best route. At one point, I lost my grip at a slot-like section between two giant boulders, and I slid backwards about 10 feet before Dylan caught me. I sat there for 10 minutes before I found the courage to press on. We soon reached the Trough, a broad gulley area of the mountain filled with loose rock that features one of the steepest stretches of the entire hike. Once we finally made it through most of this treacherous section (which we kindly named the death march), we climbed over a slightly tricky spot to meet the bottom of the Narrows. The Narrows is a sheer vertical rock face that’s trimmed with a teensy little ledge, which juts out over thousands of feet of nothingness. But this time, that little ledge was our walking space. Thankfully, there were a series of boulders and hand holds that assisted us on the constricted path, but I still leaned my body inward and bear hugged the mountain almost every inch of the way. When you’re at 13,000 feet on the side of a mountain, every single step matters. Photo by Dylan GideonOften the most feared part of the hike, The Narrows section on Longs Peak requires hikers to make their way around the mountain on a small ledge and offers little room for error. Rather than a trail, hikers follow yellow and red bull’s-eyes. After I carefully hiked my way around the Narrows, just one more section stood between me and the summit. This section is the Homestretch, and it features a polished granite slab that requires nearly vertical scrambling with your hands and feet. Our journey wasn’t hiking at this point—it was rock climbing. While I was exhausted, seeing the summit above gave me a rush of energy. We soon found ourselves at the top of the Homestretch, and then we took our last steps to the top. A smile took over my face the second I made those steps. With the clouds just above my head and mountains surrounding me in all directions, I felt like I was on the top of the world. At 14,259 feet, it was certainly the closest I’d ever been. We took some photos and ate a snack, then sat for a minute before we started our journey back down. Our descent started off well. In fact, I hardly remember coming back down the Homestretch and the Trough, I think because I was still on a natural high. I was so happy for that 45 minutes or so. I thought the hard part was over. But once we made it back around the Narrows, the sky suddenly changed from bright blue to the darkest shade of gray I’ve ever seen. It was almost black. I lost site of the bull’s-eye I’d been heading toward for the last 30 seconds. I heard thunder, but not the kind of thunder I hear at home. This thunder rattled my eardrums, and it shook the mountain underneath my boots. At that point, we realized that the hard part was far from over. Dylan and I pressed on for five minutes or so, trying to cover as much ground as we could. The rain began to fall faster and harder, then it turned to snow and hail. The rusty brown mountain we climbed up just an hour ago transformed to an icy, cold shade of white before our very eyes. Most of it was now covered in ice, and the parts that weren’t were flooded with rushing streams of rainwater. We took shelter under a boulder for 10 minutes or so, trying to figure out the best thing to do. Do we press on? Do we wait for it to stop? Neither of us had a clue, but as we watched the mountain become more and more packed with ice, it became obvious that waiting it out wasn’t our best option. I prayed. Photo by Dylan GideonDylan Gideon and Savannah Waszczuk took a moment to enjoy mountain views after passing through The Keyhole. I don’t know how, but we carefully navigated our way back across the rest of the mountain to the Keyhole in the midst of the hail storm. Dylan led most of the way, and there were times where I felt I might watch him slide off the edge and fall to his death. He felt the same about me. I never understood why someone would hike the mountain when it was covered with ice and snow and posed such high risks, but I realized it at that very second. Storms are unpredictable, and they happen fast. While we trained to climb and we packed gear for the summertime adventure, we were in no way prepared to hike on the ice. After reaching the Boulder Field, we strapped on our packs and slowly walked the remaining 6 miles back to the trailhead. Search and rescue helicopters flew in the overcast skies above us, and I was thankful to be alive with every step. A lot of firsts happened to me on that hike, including a great one—my first time conquering a 14,000-foot summit—and an awful one—my first time I’ve ever felt like I truly may die. But by the time I reached the bottom of the mountain, I decided the views I saw and the air I breathed at 14,000 feet made it all worthwhile. 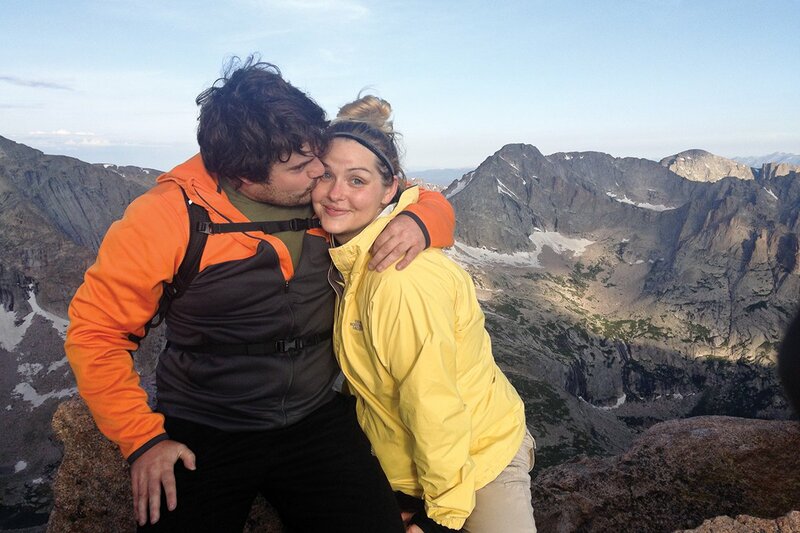 I had a new-found love of conquering fourteeners, and that monster of a mountain was now off of my list. 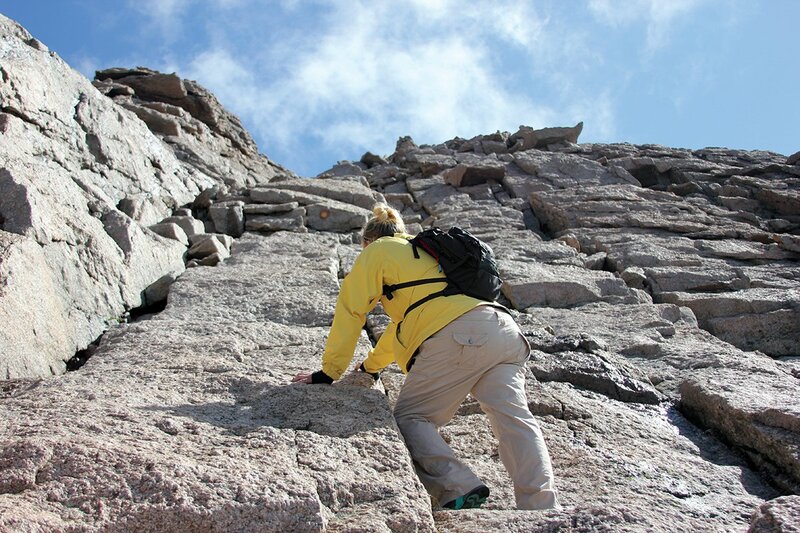 Ready to plan your own trek up Longs Peak? Read on for tips for a safe and successful journey. In general, the most snow-free and ice-free time of the year to climb Longs Peak (without gear) is mid-July through mid-September. Even then, though, unpredictable storms can cause ice and snow on the mountain. Check the weather the day of your hike at mountain-forecast.com. 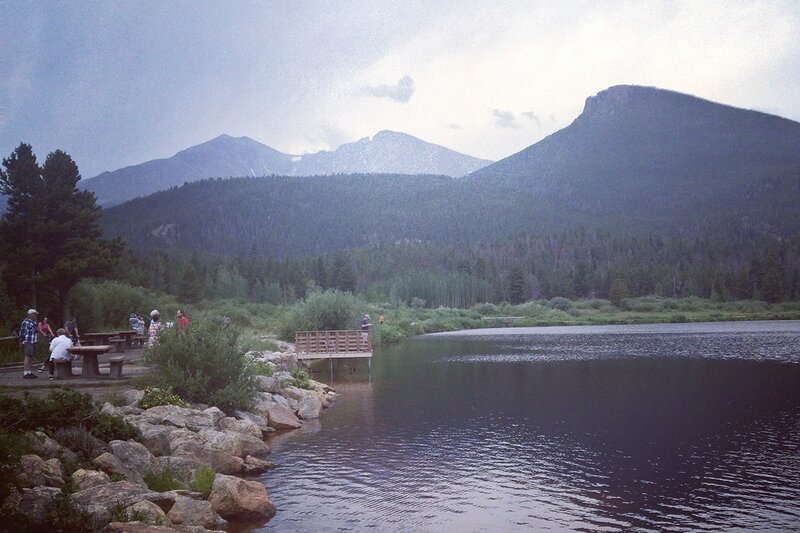 Longs Peak is roughly a 13-hour drive from Springfield. If you roadtrip, consider taking a four-wheel-drive vehicle. Once you’re there, there are lots of hills and steep terrain to climb. You’re in the Rockies, after all! While you don’t have to break your hike into two days, a break makes a summit victory much more likely for beginners. You can find info to apply for a permit and learn more about the mountain by searching “Longs Peak” at nps.gov. If you’d like to camp on other days of your trip, do your research—many national forest grounds in the area offer free camping. Longs Peak is the highest point heading north between central Colorado and the Arctic Circle. It takes several days to adjust to the altitude, and you should condition yourself with progressively longer and more strenuous hikes. Don’t climb alone, and stay with your group. Be sure to tell someone where you are going and when you expect to return. 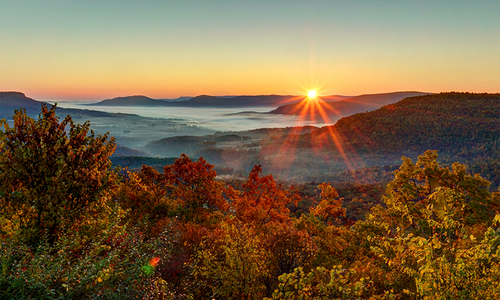 The Ozarks are a wonderland of trails, both hidden and super-accessible. Here's how to get out there and enjoy them.